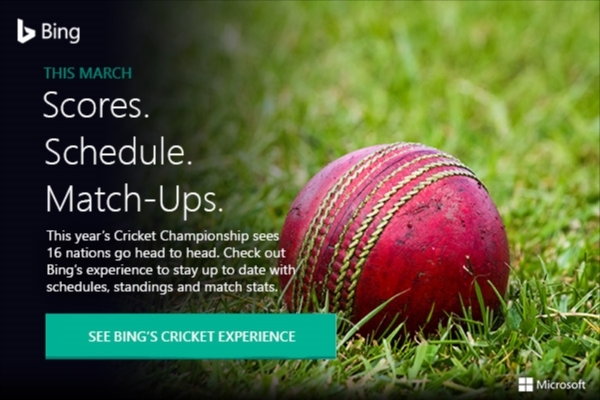 Windows Hive Cortana news Get Ready for T20 Cricket Season with Bing! Get Ready for T20 Cricket Season with Bing! Well, the cricket season is here and the entire world is going crazy about who would win the World Cup T20 Trophy this year. For all Windows Lover, Microsoft today released an update to Bing and Cortana search which would now tell you about World Cup Fixtures, Give you Predictions, Test your Cricketing Knowledge with a daily quiz and keep you update with ball by ball commentary. What happening? Just search for Cricket World Cup in Bing or ask just Cortana, and you would get a result highlighting match predictions, live scores, last match results etc. What's stopping you now, Just head to your Windows 10 PC or Mobile and get ready for the most exciting Cricket T20 Season. Anyways, which team are your supporting? Our favourite is INDIA.